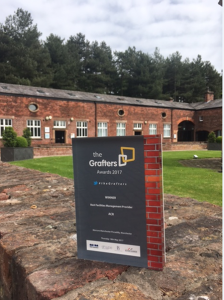 Stanley Grange residents ACR were delighted to scoop the title of “Best FM Company” at the prestigious Grafters Awards on 18th May. Facilities Management is one of the three main pillars of their business – the others being Architectural Design and Civil & Structural Engineering. In short, ACR have “Building Wisdom” that offers a complete conception to completion service when you are building or extending a commercial or industrial property. That Building Wisdom continues to be applied in outstanding Property Maintenance FM – whether it’s something ACR have designed or an existing property you own or rent. ACR’s MD Simon Robinson said “This is a very special award for us because it truly reflects the outstanding care and attention we put into keeping our client’s buildings safely maintained and legally compliant. The awards evening itself was a superb event and it’s going to be in our memories for a long time. Myself and the great team at ACR want to extend a huge thank you to everyone who voted for us”.